Suzanne, Keith Arnold (principal with Suzanne Kasler interiors), and I met last week to start thinking about the design approach to the bathrooms in the new house. Suzanne likes everything about bathrooms to be clean, classic, and timeless. We went through each bathroom on the house plan and discussed cabinetry, tile, and plumbing fixture options at a very high level. Suzanne said that in the past, she would often select different fixtures for each bathroom, but these days she is being consistent in the guest and children’s bathrooms, and doing something more unique and special in the master bathroom and powder room. As much as I love decor, I rarely notice details like plumbing fixtures. Just walking into a plumbing showroom makes my spirits flag almost immediately – there are so many choices! This is why I love working with an experienced designer. For my particular project, Suzanne immediately narrowed down the faucet style to a few selections, and really – to two styles. The column/farm style faucet and the low profile faucet. Both are classic and elegant, which will fit the style of the house we are building. The first category is this shape, which has a column and has a vintage feel. When looking at this style, Suzanne noted that she really likes the Julia faucet by Waterworks (seen above). I see this style quite frequently, and I admire the pretty lines of this faucet and the delicate lines of the handles. On the Waterworks website, the faucet is described as ‘representative of 1920s French country’, and there is a picture of a French house with a field of lavender. This makes me like this style even more! The Julia also comes in a low profile version. I like this version very much, but I think if you are going to go for this style it might be good to go for the higher profile. Whatever we choose for the master bathroom, it will have lever handles, as my husband does not like the cross handles. I love cross handles, so will probably use them in my children’s bathrooms. My builder and architect also suggested that I look at Newport Brass. Newport Brass has a nice version of this style, the 930 series (this is the catalog picture, I will be doing a nickel finish in whatever style I end up selecting). Perrin & Rowe is another company that my readers recommended when I posted about kitchen sinks, and they have a version of this classic design. When looking through my pictures, I found quite a few bathrooms that have the farmhouse/column style faucet. Here it can be seen in one of my favorite bathrooms from architect William Hefner’s portfolio. Design Lori Tippins used pretty faucets in this style (not sure of the brand) for her daughter’s bathroom. The guest bathroom in Lori’s home also has this style spout. 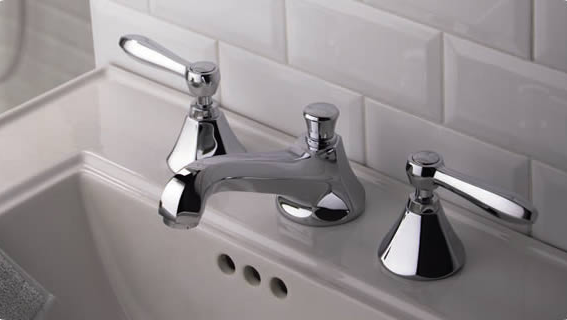 Suzanne also likes low profile faucets like the Highgate in the Waterworks Studio line. She thinks this would be a good choice for the guest bathroom and children’s bathrooms. The Astoria by Waterworks is the faucet that Suzanne chose for her own bathroom in the 1930s home she recently renovated, and it is a possibility for our master bathroom. Suzanne loves the shape and substance of the handles on this faucet. Given that I have been looking into Perrin & Rowe fixtures for the kitchen, and this pretty fixture from the Perrin & Rowe bathroom line caught my eye in the store. A reader from Connecticut told me that she used Rohl (the parent company) and Perrin & Rowe fixtures throughout her house, and she is pleased. Here is the Newport Brass version of this fixture (this is the brand that I selected for the master bathroom in my current home). The 920 series has the nice low profile look. Brooke from Velvet & Linen used this faucet on a recent project. I also like the Newport Brass 1200 series, as the handle bases are more bell shaped. Levers or cross handles can definitely have an impact on the look of a faucet. The Grohe Somerset has nice clean lines. I have always been so happy with everything I have used from Grohe, so I have a certain amount of customer loyalty with their line. Too bad this faucet only comes in three finishes! San Francisco based designer Elizabeth Dinkel used the Waterworks Highgate faucet in one of her designs. Another bathroom designed by Brooke Giannetti uses a low profile faucet to great effect. To me, this is how a bathroom should look – light and fresh and clean. A low profile faucet in a bathroom designed by S.R. Gambrel. One of my favorite pictures of a master bathroom uses both styles in one space: the column style in the bathtub, and the low profile in the sink. The powder room will have a special fixture. This little gem is from Waterworks – the Opus. As soon as I saw it in the Waterworks store, I loved it; the clear egg shaped handles are really beautiful in person. Turns out that Suzanne has this faucet in the powder room of her office. Suzanne said that we could consider this for the powder room as a special touch. Another picture of the Opus. So, what do you like – the column style (is there a better term for this?) or the low profile style? Let me know your thoughts in the comments, and please vote in the poll (email readers, click here to participate in the poll or comment – the poll is in the upper right hand corner of the blog). Whatever Suzanne ends up selecting, she likes to use the same line for the shower, bath, and faucets as the finishes from different lines can vary dramatically. As always, I look forward to reading your thoughts! def adore the somerset - they are diving, the others are very traditional, if you are going for that look (I'd steer clear of anything a builder recommends eg. brass!!! ), somerset all the way for me! ALSO nice to see a curtain in one of the bathrooms above, I'm currently decorating my ensuite and doing my head in whether I can put up a curtain (or swag) over the boring window... Your photo gave me confidence, because most bathrooms don't have any fabric of any kind! I like the Perrin & Rowe style low profile, but for the high profile column style, the Waterworks Julia is my favorite - the lines are much more delicate, which I prefer. So many choices - but it is nice to have Suzanne narrow it down to just two styles! I love the farmhouse column style. Those baths are gorgeous. You know I was waiting for this post! And, of course there is so much to think about. First the easy one. Get the Opus faucet for you powder room, the egg knobs are divine!!! I love faucets and always notice them. I can spend hours in Waterworks, Ferguson, and online, just browsing and admiring the offerings. It is a challenge to change lines with regard to finishes,but certainly possible. So try to get exactly what you love. Last year I did a bathroom using your beloved Grohe for the shower and faucets from Restoration Hardware both in polished nickel. As far as low profile vs. column, I don't have a strong preference because for me it is always about the beauty, how the handle feels, and does it compliment the style of the bathroom. I will mention(of course)the column style is slightly easier to clean under. Just as an 8" spread is easier than a 4" spread to clean around. I love the first one, representative of 1920s French country, very lovely. The higher profil version is much better than the lower one. I adore the Opus egg hand style for the powder room. That is the first time I've seen them, so thank you for the eye opener! Secondly, I agree with Acanthus and Acorn about the feel, that usually makes the final factor for me when personal visual choices are narrowed down! Lastly, I don't think you can go wrong with any of them! When we built our house our goal was to build a new "old house." It's a Federal style clapboard house - think Virginia and New England. We wanted the bathrooms to feel low key and not too fancy, like they would be in an old house. So, I used the same faucets in every bathroom (boy did that save a lot of time too). I picked a classic, timeless faucet that I hope will not ever be dated. It's the Rohl 3-hole widespread Cisal Classic with cross handles. We had problems with the levers on the faucets in our house (they broke off after repeated use) so we went with cross handles in the new house. I used a polished nickle finish in every bathroom except my sons', where I used polished chrome. I love the continuity of using the same fixtures everywhere - that way you notice the feel of the house, not the things in it. I love the faucet she selected! I also prefer lever handles. It's nice to be able to see how they look in an actual bathroom, too. I really like the column/farmhouse style faucets. We're using one that looks very similar to the William Hefner and Lori Tippins pictures - the Delta Victorian. I can't vouch for the quality of the brands you mentioned, but I've never had any trouble with Delta products. And they cost less than a towel ring in the similar Newport Brass style! Oh, I love this blog!!! Such beautiful pictures. Good luck with your choice. I just remodeled my kitchen and one bathroom. I didn't have a problem with plumbing fixtures really. My really hard thing was lighting!! Oh my!! Very hard for me. And in fact, I still am not happy with the bathroom light. The eggs are cute, never seen those in person. As bathroom cleaner in chief, I wish ours weren't so shiny so they didn't show water spots. I also wish on our smaller sinks that the fixtures allowed a little more space to clean behind. Each choice really has its merits, great selection. Doesn't look like you can go wrong here...and really like the idea of mixing it up in one bathroom. I love the look of the column style but having both in my house you tend to get a lot more splash with that style, which means of course more cleanup:( Suzanne designed the house next door to me at Reynolds (the Lady's Golf Digest house) and I love, love, love her work! Good luck deciding! Oh the eggs....truly magical I've never seen them and I LOVE the unexpected! Love all the other choices too, I would rather spend money on this type of jewerly than something that goes around the neck. I love the Opus and prefer the column style faucet. I have both styles and find the other much harder to clean. Both would look lovely though! I prefer the column style too. I am enjoying seeing your decision process! I love Julia faucet for its classic, sophisticated form and as you mentioned the vintage feel, plus the lever handles makes it easier to handle by people of different ages. I like that Suzanne prefers to keep things streamlined, because it makes decision making much easier. Sometimes it is nice to have options, but with things like tile, faucets, fabrics - I like to have a limited selection to choose among. Sometimes I see something, and it just feels right - that's how I felt when I saw the Opus. There is going to be an oval window in the powder room, so the oval of the handle would be a beautiful way to repeat the shape in the room. The eggs are wonderful. I personally like the higher column profiles! The Opus faucet is a perfect powder room fixture. It's special without being overly fussy. I find it reassuring that a designer like Suzanne Kasler, for whom I have so much respect, is leaning towards more simplicity in her design decisions. Thank you so much for including a couple of our bathroom designs in you gorgeous post! It is so funny how many MANY decisions go into building a home! I always find the bathrooms to be the most difficult because there are so many and you want each space to have something special. I love the powder room fixture! Have fun! I love the Opus! Do you know the cost? I think the Julia faucet is an excellent choice! Timeless. Also the Opus faucet in your powder room will look so chic. I would echo the rounded egg shape in the tile, lighting or wallpaper. Can't wait to see it all when it's complete. What a fun post. Beautifully done bathroom...every bit of it is planned perfectly and done with clear precision.Like the combination and definitely the materials used for the build up. I definitely prefer the low profile. I'm already tired of the column style, and think it will look dated much more quickly than a classic low profile would. Love the glass handled Waterworks faucet for the powder room! Great bathrooms...Love the scones and the light fixtures over the sinks in the Gambrel bathroom. Love the column/vintage feel of the first few beautiful bathrooms.I agree with Terry, too, about making sure you have adequate space behind to clean. Have fun with the process - I am jealous! I love what you are doing on the blog, but do you think that by posting your designer's choices on here you are second-guessing her work...what you've hired her to do? (You certainly do not have to post this comment, as I'm not looking to create drama on your blog. Just a thought I had...but I wonder if there too many cooks in the kitchen since everyone has a totally different opinion). Maybe you should consider keeping copious notes about the entire process, but then do a step-by-step once the house is actually completed. By then, a single faucet decision may not seem like that big of a deal and I'd hate for you to "tire out" your readers by including them in every single decision. But that's just my two cents. Again, best of luck with your project and continued success with your blog. It is a delicate balance, building a house and writing a blog. Initially, I did not plan on even mentioning that I was building a house. Naturally, though, it has crept into the blog slowly, and is now a significant part of my life and the blog. I have a great team in place, and I will certainly go with whatever the team recommends. I find it interesting and informative to hear about the experiences and opinions of my readers too...for example, the comment about different fixtures being easy to clean, and the private emails I received about people's experience with the various items that I have posted about. I don't see this as second guessing the designer. I see this as laying out the choices, maybe even for TTI's own thought process. I get the impression that the designer narrowed down the choices, and will work with TTI to make the decision. We are just along for the ride! I just love your blog! This post was so informative. I am in favor of the low profile even though it sounds like they're harder to clean. The column examples look a bit more like kitchen fixtures to me, plus I wonder about the splash factor w/ a smaller sink, kids, etc? I love being included in the process as you build your home. The faucet options are absolutely divine. And the eggs are fabulous. Please consider function. For example, what if you have to fill something like a sitz bath because you're post-surgical? Yes, there's a tub, but bending over isn't always optimal/possible. Will the sitz basin fit underneath the low profile so you can fill it ? (my experience is that it's sloppy to remove, as you have to tilt the basin because there's not enough clearance). Maybe you won't want to publish this comment, but it's something you might want to consider. This is a great series of posts that you are writing!! I love the one with the egg shaped handles for the powder room! As always,great post! I just chose the opus for our powder room. I have waterworks fixtures and they look great - years later. Very happy with the quality. Love all your choices and know you will make a perfect choice! so enjoying the journey with you and your new home. LOVE the opus, to die for! 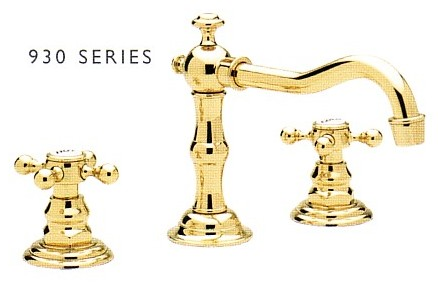 We have the Newport Brass 930 series in our entire home. It's very lovely and quite stylish. All our neighbors have it as well. Why so popular? Apparently it was the builder's default fixture. Not a bad choice at all. Unfortunatley there is a recurring problem. The ceramic discs which label the Hot and Cold valves (as well as the Arrow disc in the shower) continuously fall off. We repeatedly reapply them with various adhesives (krazy glue, gorilla glue, etc) which work for a while, but they inevitably fall off again and often go down the drain. It has become a running discussion in our neighborhood over which adhesives work the best and how to get new discs from Newport Brass. Just thought you should know. 1. The round glass handles could prove to be difficult for wet hands to turn off. 2. The higher necked faucets do seem to be more ergonomically designed. Taller people do not have to bend quite as much when washing hands, brushing teeth, and washing ones face. Just something to think about. Wish I had time to say more, but mothering duty calls! Hate to be a follower but I too like the eggs. This post is fantastic. I love plumbing fixtures, they are like jewelry in the bathroom! Holly, I just noticed the opus faucet on ebay. I just checked ebay, and saw the Astoria faucet, but not the Opus. Thanks for the tip! Although ultimately Suzanne will have the final say in selecting the faucet, I appreciate hearing all of these tips from my readers. I like to know how things will work, and hearing about actual experiences with these products is incredibly helpful - as ultimately function must be considered, as well as form. My favorite part of your blog thus far is going on the journey with you while you narrow down your choices for your new home. Family, friends, and faith are obviously the most important things in life but while building the 'smallest' decisions seem the hardest. I do not think of it as 'second guessing' your team but of you spending time on the decisions as well, and you should, it is your home in the end. Please don't let any negative comments left on your blog change the way you write it, as it, too, is also your blog. Blessings to you and your family and your wonderful blog. I rather like the column-style for a bathtub and a low profile for a sink. And that Opus faucet is FANTASTIC for a powder room. I voted for the farmhouse choice. I really like the faucets that have "Hot" and "Cold" on them on white on the top. Especially for a child's room! The one with the egg knobs is absolutely marvelous!